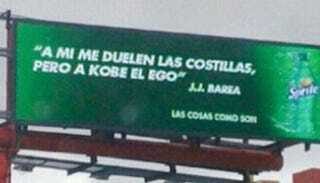 There's a strange inter-endorsement battle taking place across the ocean on a billboard in Puerto Rico, where Sprite spokesman JJ Barea is quoted taking a shot at fellow Sprite spokesman Kobe Bryant. This sign, originally dug up by Bethlehem Shoals, translates to, "Only my ribs hurt, but for Kobe, it's his ego." So simple, and yet so refreshingly effective.